With shoppers more comfortable than ever buying home goods large and small online, successful furniture and home goods brands on Amazon are driving more sales online by describing their products accurately with their bullets and description, going heavy on visual content, and producing a quality product that helps elicit valuable reviews on Amazon. And lagging brands need to address gaps quickly, with IBIS World estimating that over 15% of U.S. furniture sales in 2017 were through online channels. Our latest report, The Winning Elements of Amazon Furniture & Home Goods Pages, analyzed more than 365,000 product pages live on the ecommerce giant within the Bath, Bedding, Furniture, Home Décor, Kids’ Home Store, Kitchen and Dining, Office Furniture, Patio Furniture and Accessories, Seasonal Décor, Storage and Organization, and Wall Décor subcategories. We used the Amazon Sales Rank of each product within its category to determine top performer and poor performer averages. To provide some additional clarity, top-performing data is also broken down into individual Furniture and Bed & Bath groups. 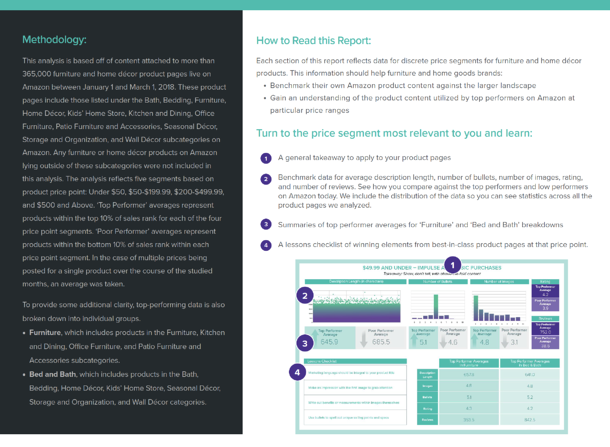 Use this data to evaluate your product content on Amazon. Successful brands are speaking to their prospective customers with engaging content, in a way that takes into account Amazon’s algorithm, unique user experience, and shopper journey. The analysis reveals how important images and reviews in particular are for attracting buyers in furniture and home goods. Top performing product pages across every price point have substantially more images and reviews on average, as compared to poor-performing pages at the same price point. Additionally, while the impact of description length and bullet count aren’t as dramatic at lower price points, they are much more evident with more expensive products. Get the full set of data, including top product page examples, to better prepare your strategy for the remainder of 2018 and beyond.